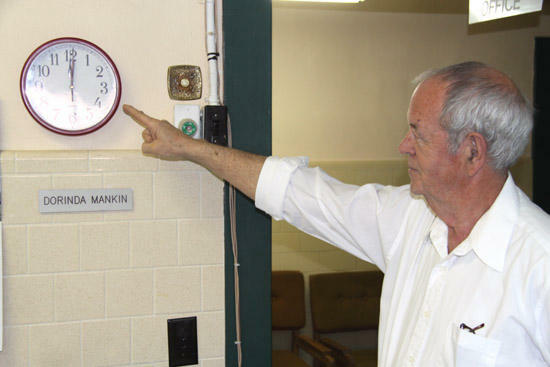 Cannon County Administrator of Elections Stanley Dobson points to the clock in his office Thursday to mark the deadline to receive qualify papers for the August 5 General Election. When the noon qualifying deadline came and went Thursday, there were a total of 60 candidates for the various county offices which will be up for election in August. Perhaps the most surprising news of the day was the decision of one incumbent to not seek reelection. Current County Trustee James Maxwell decided that two terms was enough, and did not turn in his qualifying papers. That race has drawn the most candidates of any, with eight people seeking the office during the August 5 General Election. Those candidates who did qualify to run for county offices have until April 8 at noon to withdraw and not have their name placed on the ballot. Also, person who still might be interest in running have until June 16 at noon to qualify as a write-in candidate.